Usually when I bring baked goods into work, my coworkers don’t comment on the look of the item, they just comment on the way they taste. But when I brought in these cakes, nearly everyone commented on how amazing they looked…before they even tried one. I guess you really can’t go wrong with chocolate cake, covered in chocolate ganache and topped with crushed up candy canes. 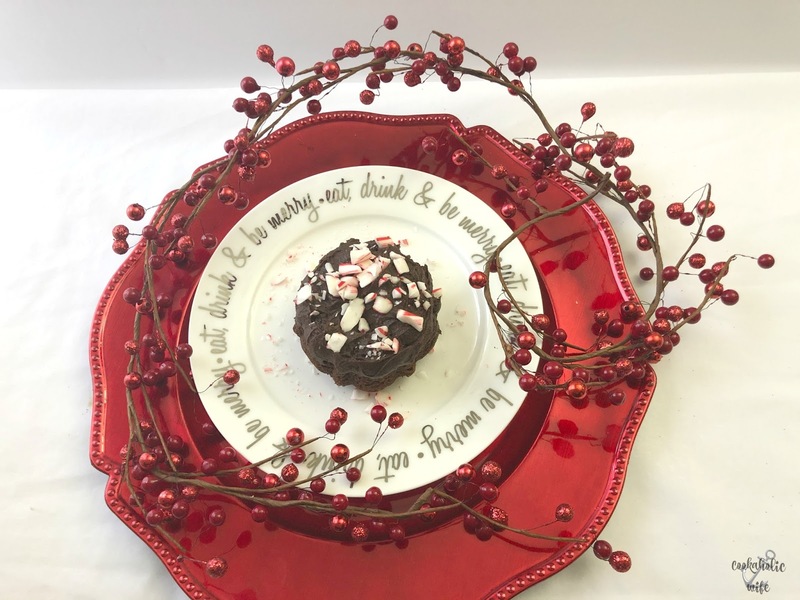 #BundtBakers is a group of Bundt loving bakers who get together once a month to bake Bundts with a common theme or ingredient. You can see past events and learn more about the group by visiting our home page. We take turns choosing the theme/ingredient and hosting each month. Our host is Sneha of Sneha’s Recipe and the theme for December is Christmas Bundts. 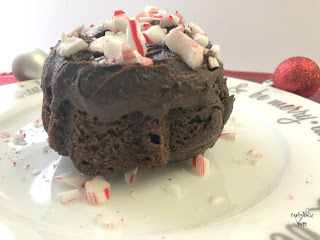 I knew I wanted to do a chocolate cake and that I wanted to use my mini bundt pan but I wasn’t sure what to do other than that. 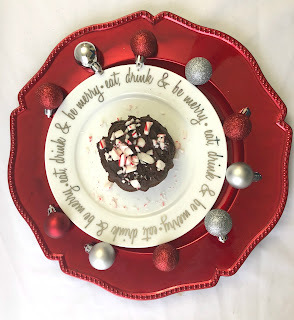 I decided to figure it out while baking, and the remainder of the idea came to me as I moved my bottle of peppermint extract to find the vanilla. Mini chocolate bundt cakes covered with ganache and peppermint. Preheat the oven to 350 degrees. Spray mini bundt pan with baking spray. In a medium bowl, whisk together the dry cake mix and dry pudding mix with the sugar. In the bowl of a stand mixer, add the eggs, water, applesauce, sour cream vanilla and peppermint and beat on medium speed until combined. Add in the dry ingredients and mix until combined. Fill each cavity of the mini bundt pan halfway full. Bake for 17-19 minutes or until the cake springs back gently when touched. Remove from the oven and allow to cool in the pan for 5 minutes, then gently run a knife around each of the cavities and extract the cake, placing it on a wire cooling rack to cool completely. Meanwhile, prepare the ganache by pouring the heavy cream into a medium saucepan and heating over medium-high heat until it begins to simmer. Remove from the heat immediately. Pour chocolate chips in a glass bowl. Pour the heated heavy cream on top and cover with a lid for 5 minutes. Remove the lid and use a whisk to gently stir the mixture together, working from the outside in, stirring until all of the chips are melted and the mixture is smooth. Once cakes have cooled enough to handle, dip each cake in the ganache mixture and return to the cooling rack. After a few hours the ganache will have thickened up to a frosting like consistency. Stir it, and dip the tops of the cake in the mixture again. Sprinkle the crushed candy canes on top and serve. I think double dipping into the ganache really make took these little cakes over the top. The first dip was just enough to moisten them further, but the second dip is what created a thicker, frosting-like consistency that allowed the crushed candy canes to stick to it. If you’re a fan of chocolate with a side of chocolate, this cake is going to be right up your alley. You can follow our Pinterest Board to see all of our wonderful Bundt creations. Love the peppermint flavor in this cake. Don't you just love it when something looks as good as it tastes??? 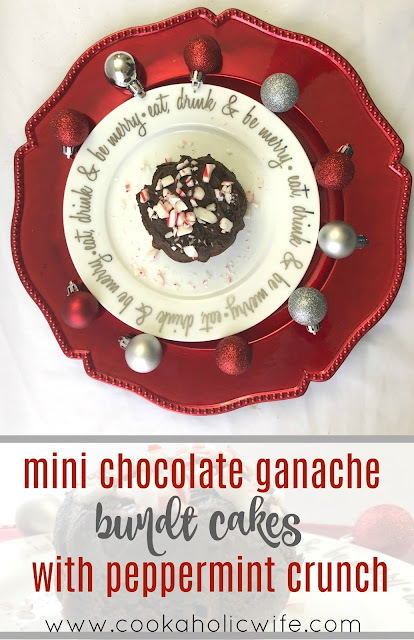 Happy Holidays and yes, your mini Bundt are super adorable! Perfect little bundts Nichole. Merry Christmas. These are cutie patooties and I see why they got rave reviews!